A-Z Air Duct Offers the Best air quality solutions to the residents of Phoenix & are keenly aware of the need for good indoor air quality. With the breakout of wildfires and other allergens, more homeowners are taking a proactive stance to improve their home air quality to protect their health. Read on to discover more about air quality solutions and how they can benefit you. What are Air Quality Solutions and Why Are They Important? Air quality solutions encompass a wide range of services designed to purify the air being circulated in your home. They cover all the bases of air quality and home health. Common home air quality problems come from allergens that are introduced to the home via pets and humans. By tracking in dust and pollen, your air quality suffers. Keeping your home sealed up and not regularly changing your filters will result in lower air quality. The direct result will be having trouble breathing or allergic reactions to the pollutants. Pollutants can impact the quality of the air inside your home. Pollutants, like smog, are often created by wildfires or other outside sources. Be sure to air out your home regularly to prevent these particles from getting trapped inside. 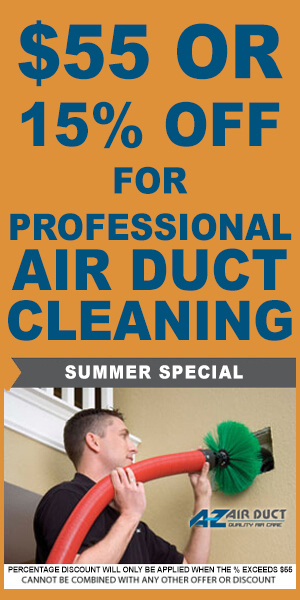 A-Z Air Duct offers a number of air quality solutions in Phoenix, including our Air Scrubber Plus service. Our Air Scrubber Plus service works diligently to kill harmful bacteria and eliminate mold and other spores in your home’s air. This system provides numerous benefits to you as it cleans the air and helps you breathe easier. Treating air directly leaves your HVAC system pushing clean and fresh air into your home. The sooner you begin treating these problems, the better your health will be. A-Z Air Duct is familiar with the challenges of maintaining excellent air quality in the Phoenix area. We have been working with homeowners for many years to keep their homes healthy, and for more information about what the Air Scrubber Plus can do for you, contact A-Z Air Duct today and schedule your consultation right away. 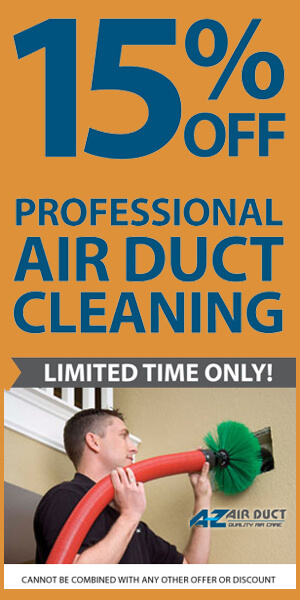 Call us at 602-­466­-2234 A­-Z Air Duct is a Professional, Family­Owned and Operated Air Duct Cleaning company serving Phoenix and all surrounding cities. Which contaminants can affect my home? In Arizona, we have a large amount of dust, pollen, and other potentially harmful particulates. Pet dander, viruses, and bacteria, to name a few. These particulates can enter your home at any time. Breathe easier with The Air Scrubber Plus® air filtration system with ActivePure™ technology. Allergens? They can’t be worse than going outside, can they? According to the EPA, our indoor environments are two to five times more polluted than the air outside. In some cases, there are more contaminants. Our professional energy auditors can help assess your indoor air quality and determine how it is affecting your daily life. Can’t I just change my air filter? Yes and no. An air filter can help keep your home clean, trap contaminants that come in through the venting system. This helps your HVAC system run smoothly. The Air Scrubber Plus® air purification system actively treats your surrounding environment, drawing contaminants in, to act offensively. The active treatment reduces the number of harmful chemicals, mold, odors, and other pollutants. They stay out of your home and out of your lungs. Does the Air Scrubber Plus® air purification system get rid of odors? How? Air Scrubber Plus® utilizes specialized germicidal UV light waves paired with a proprietary catalytic process. This unique combination sets it apart from a typical air purifier and helps to reduce dust, pet dander, and odors in your home. How quickly will the Air Scrubber Plus® make a difference in my home? The difference is noticeable right away and within 4 days of installation, Air Scrubber Plus® is at its’ maximum efficiency.